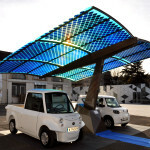 Microgrids are among 15 opportunities that can fix some big, world problems. That’s the word from DNV GL in a new report that looks at five global threats and the doors they open for innovators. One of the threats is our reliance on fossil fuels, says Global Opportunity Report 2015. Microgrids or “energy autonomy” offers an alternative path. “This report aims to demonstrate that the great sustainability challenges facing societies today do not have to be seen only as risks to lifestyles and businesses as we know them. They can be seen as wake-up calls for us to start building a better world,” says the report, which emerged out of workshops with 200 experts and a survey of more than 6,000 public and private-sector leaders in 21 countries. Microgrids serve both rich and poor nations, but in different ways. They create the reliable, clean power needed by advanced economies. And they bring electricity to the energy poor for the first time. Because they fill these two roles, microgrids have a kind of economic staying power. The technology does not “become redundant in low-income communities as they grow richer,” says the January 20 report. Africa offers one of the most pronounced examples. Microgrids and related distributed energy are likely to contribute 60 percent of the power needed to fully electrify the continent by 2030, the report says. The report points out that the beauty of using renewable distributed energy is that it’s modular. Poor households and communities can gradually scale up as their demand for electricity grows. Energy autonomy offers a significant opportunity for business. In fact, those surveyed rate it as one of the top three opportunities created out of today’s global adversities. Those in the finance sector were the most positive about it. 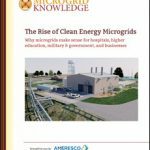 The report offers examples of several companies, organizations and communities on the vanguard of microgrids and energy autonomy. In North America, Solar City is helping to create the ‘prosumer’ with innovative financing that allows households to more easily install distributed energy. Meanwhile, Aquion Energy is supplying rugged off-grid and microgrid energy generation systems with storage and back-up power. interact with households in Bangladesh, with a goal to finance four million solar home systems by 2016. 80 percent of the sun’s energy into electricity and heat. The Kenyan government, Indigo and Microsoft, are creating solar-powered base stations to provide broadband in remote areas. M-KOPA is offering ‘pay-as-you-go’ solar energy to 100,000 off-grid households, which would otherwise use harmful kerosene. Gram Power is securing private or subsidy funding to set up renewable energy microgrids and smart meters in places where electricity is available less than six hours per day. Mannheim, Germany is trying to create a model city for decentralized energy. Operating as a public-private partnership, the city wants to deconstruct the barriers between energy consumers and producers. The world’s over-reliance on fossil fuels also paves the way for other kinds of energy opportunities, such as innovation in regulation and consumer behavior programs, the report says. In addition to reliance on fossil fuels, other risks evaluated in the report were: extreme weather, water scarcity, unsustainable urbanization and non-communicable diseases. “Businesses across the planet are not shying away from global risks such as climate change, and increasingly recognize the positive benefits of seizing the related opportunities. The report confirms that there has been a turning point, where private sectors are now a critical driver of sustainable development with emerging economies in the front seat,” says Georg Kell, executive director of UN Global Compact. The report, produced by DNV GL, UN Global Compact and Monday Morning, is available at www.globalopportunitynetwork.org. 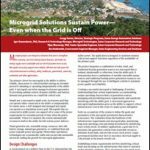 Join our LinkedIn group, Microgrid Knowledge, to learn what others think of the role microgrids play in alleviating global risk.